The stock market can seem intimidating to those who know little about it. 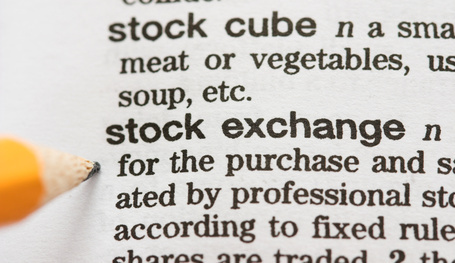 A stock exchange is a trading facility for stock brokers to trade stocks and other securities. Historically, organizations that resemble the current stock exchanges have existed since the Middle Ages. The securities traded on a stock exchange include shares of companies, trusts, derivatives and bonds. Versions of a stock market have existed since the beginning of early stock trading in the 12th century. Historical records show the speculative investments began in the Middle Ages in France and spread quickly to Venice, Italy. The modern investment system grew in the 1960s and 1970s with the influx of financial planners and money managers. As western universities began offering career-oriented "financial advising" degrees, according to Investmentadvisor.com this increased the significance of stock exchanges internationally. The most popular stock exchanges in the United States are the New York Stock Exchange and the NASDAQ. The NYSE was founded in 1792 and is known as a listed exchange. The NASDAQ is often considered the most prestigious exchange after the NYSE. Brokerage firms issue orders and trade with brokers on the floor to sell stocks or bonds during trading hours. There are other types of exchanges, including over-the-counter exchanges which are riskier entities unregulated by government regulating boards. Penny shares are often sold here. Other international exchanges include the London Stock Exchange, the Bombay Stock Exchange, Tokyo Stock Exchange and Berlin Stock Exchange. Six continents have stock exchanges. There are a variety of ways that people invest in the stock market. Traditional brokers charge a commission for investments and act as personal consultants and advisers to individual investors. First-time investors often use full-service brokerage firms to advise them when to buy and sell shares. The rise of discount and online brokerage firms has allowed for less expensive methods of advising and investing. Discount firms will not advise on strategy, but will invest for individual investors for a set fee, unlike full-service brokerage firms that often work for commission. The Wall Street Journal contends that using traditional stock exchanges that are regulated will prevent vulnerability to Internet scams or penny stock schemes on over-the-counter exchanges. CNN Money says that seasoned investors often buy stocks online through online brokerage firms to save money on sale and purchase fees, but that this method increases risk. Stock speculation and investment is not devoid of risk and can often lead to financial loss. Stocks fluctuate daily and should be monitored to avoid loss. Critics argue that stock markets creates wealth and secure investments, but historically play an integral part in economic depressions. A stock market crash triggered the Great Depression of the 1930s. Beginning investors should understand the cycles of the stock exchanges before investing. Approximately 49.5 percent of American households have invested in stocks, which many people invest in order to secure money for retirement or increase their savings. However, the recession of 2008-2009 was prompted in part by speculation and inflating the value of stocks.